The new Acela trains are part of an ongoing $2.4 billion Amtrak investment that also includes extensive renovations at D.C.'s Union Station. WASHINGTON — Amtrak has released images of the interiors of its new, faster Acela Express fleet that are expected to enter service in 2021. The new Acela trains are part of an ongoing $2.4 billion Amtrak investment that also includes extensive renovations at D.C.’s Union Station. 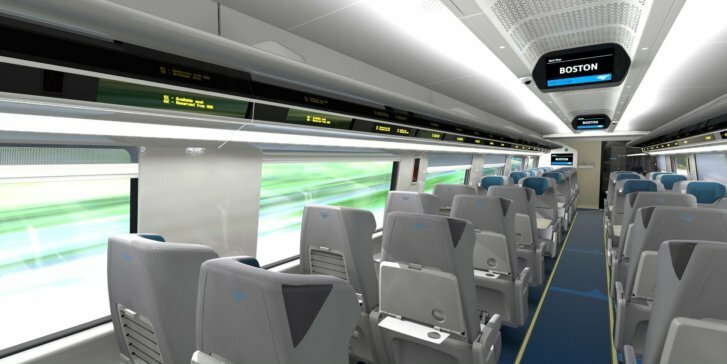 According to Amtrak, the new Acela interiors will feature smooth leather seats with integrated in-seat lighting and personal electrical outlets and USB ports. Each seat will also have two tray tables, giving passengers a choice between a small and large option. For passengers walking the aisles on a moving train, handles are integrated into seat backs. There will also be an improved onboard information system with six LED screens in each train car providing real time information on location, train speed and conductor announcements. Overhead luggage compartments will also be streamlined. The new Acela Express trains can carry up to 386 passengers, a 30 percent increase, and will operate initially at speeds up to 160 miles per hour, and will be capable of speeds up to 186 miles per hour. The prototype of the new train sets are currently in production at manufacturer Alstom’s Hornell, New York, plant and will be ready for testing in 2019. All the train sets will be in service by the end of 2022. In advance of the new Acela fleet, Amtrak recently completed a $4 million upgrade to the interiors of existing Acela trains.